Your big day is something you dream about from a young age. Planning your wedding day can be stressful, so many decisions to make, so many looks, themes, trends to consider. It can get very overwhelming. You want your day to be and look perfect. 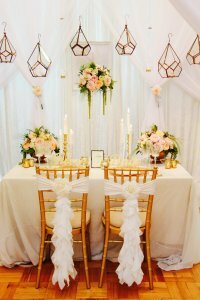 Don’t panic, we are here to help you with our guide to how you can incorporate some of the main up and coming key trends in wedding decor to make the day you&#39;ve always dreamed of, as perfect as imaginable. Choosing the colour scheme for your wedding should be one of your starting points. This will form the basis of your dress, make-up, flowers, cake and décor. The great thing about colour is you can choose how to use it. Either a full on explosion, or just had hints and accents of it within your scheme. The wedding industry look towards Pantone releasing their Colour of the Year as a steer for creating fresh new looks. The perfect shade to represent 2018 was Ultra Violet. A bold choice whether you’re a fan of colour or not! Having a full Ultra Violet scheme is a brave choice, but can be done just as we did for our beautiful bride Reena. If this look isn’t for you, but you want to add a colour pop, then alongside blush tones and classic cream, hints of ultra violet can be in your bouquet, tables centrepieces or even in small detailing like your dinner wear accompaniments. However you use this mesmerising colour, it will look beautiful. Creating a signature bespoke floral backdrop is one of the best ways to create a magical atmosphere and really stun your guests. As either a vast space of greenery with beautiful flowers or creating your own Moongate. Not only do Moongate’s look beautiful, but their circular shape also resembles the circle of life. Creating your own Moongate means that you can add anything to your beautiful showstopper. From foliage, flowers or even pearls and diamantes; there is no stopping when it comes to getting creative. Floral elements on your wedding are always a must. 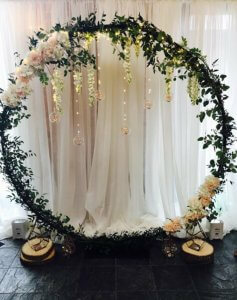 Wedding wreaths have become one of the biggest upcoming wedding trends. Incorporating this stunning look into your day can bring the outdoors, in; for you and your guests. 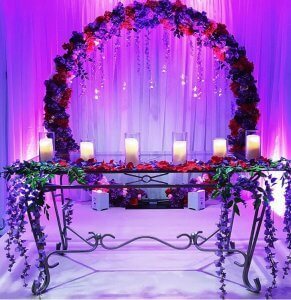 Bringing beautiful living flowers to your indoor wedding can be an amazing look to your wedding, whatever the season. These versatile hanging arrangements can be full circles or even just a crescent. Not only can you have just foliage but also your pick of favorite flowers to help tie your bouquets or your floral tablescapes together. 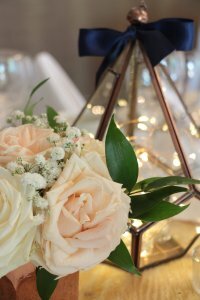 These symbolic shapes and designs are becoming a huge success within wedding decor. Not only can you use these gorgeous metallic hues as accent colours anywhere within your day, but whether you have them indoors or out, they can help add a quirky yet elegant theme. Whether you have them on your table with candles and flowers; for a calming romantic atmosphere, or use them as drop down lighting above your table and your dance floor; for a slightly more dramatic and dynamic look.